Premise: Two contestants compete to earn points by matching their answers with the celebrity panelist’s responses to humorous fill-in-the-blank questions. In rounds one and two, the “Fill-In-The-Blank Rounds”, the contestants will have the option to choose either questions A or B to answer and will be reward 50 points for every panelist they match. In the third round, the “Match-Up Round”, each contestant will pick a panelist and will have 45 seconds to match as many answers with their chosen celebrity as possible. The contestant with the most points at the end of the game will have their points converted into cash and they will play in the Super Match Round. 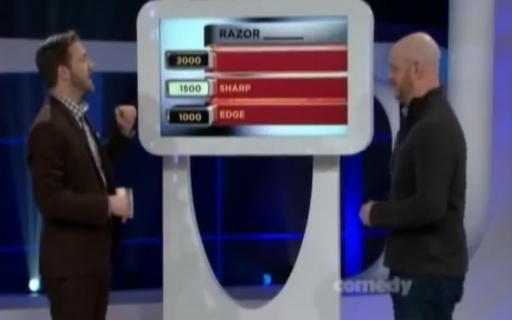 In the bonus round, similar to the original series, based on a survey of hundreds of people across the Canadian nation, the contestant will have to give their best answer to a fill-in-the-blank statement (ex. Post ______). The number one answer is worth $2,000, the second best answer is worth $1,500, and the third best is worth $1,000. If their answer did not make the Super Match board, the contestant will receive a $500 consolation prize. The contestant then has a chance to double their bonus money on the Star Wheel. Otherwise, they will play the Head-to-Head Match by exactly matching one of the panelists. If successful, the contestant will win the bonus money. Otherwise, the contestant will only win their winnings from the game. The top prize in the Super Match round is $4,000. After viewing three episodes of the new Canadian series, I can honestly say this is the best revival of Match Game I have seen since the 70s version. Like with GSN’s The Pyramid, the producers of Match Game employed the “If it ain’t broke, don’t fix it” tactic, and it worked with this show. As with most great revivals, Match Game‘s gameplay for the most part stays true to the original format and made excellent upgrades in the modernized set design, the theme and think cues, and even in the show’s logo which maintains the show’s original color scheme. The gameplay is an excellent fusion of the 70s & 90s versions of Match Game and I love the “points-to-cash” format for the revived series (although I believe the cash format should have been used throughout the entire game, but I digress). 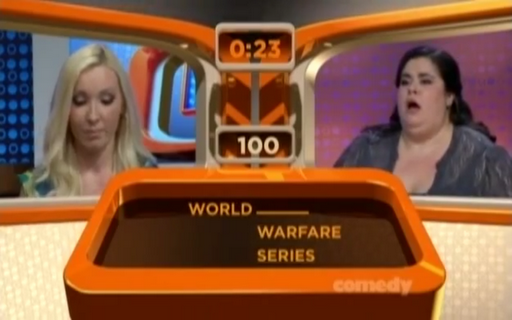 Additionally, didn’t think it was possible, but this Match Game revival has come the closest of all the post-70s Match Game versions having regular panelists to matching the Brett Sommers/Charles Nelson Reilly dynamic (excluding their brief regular appearances on Match Game ’90): Sean Cullen and Debra DiGiovanni. It’s no surprise that these two panelist regularly appear on each episode mainly because their comedic styles and delivery closely emulate their predecessors along with Sean and Debra’s great wit, good comedic timing, and from time to time, even jokingly bicker like Brett and Charles did. As host, Darrin Rose is doing a decent job so far, taking command when needed and he doesn’t get easily distracted by the celebrities talking upon reading each the question. He carries the show well at a great, solid pace; and also interacts well with the contestants and celebrities. The only issue I have with his hosting style is that he seems stiff and I believe that may stem from trying to adjust to hosting, given the fact that this is first time hosting a game show. Like with Drew Carey with The Price Is Right and Wayne Brady with Let’s Make A Deal, I believe that Darrin Rose will feel more comfortable hosting as the series progresses as he has done several times in his numerous stand-up comedy performances. Other than that, I like him hosting the show and how he engages everyone who is involved with the show including the studio audience. He just needs to show more personality and get into his comfort zone in terms of hosting. The only problems I have with the show are not major issues, but changes to give the show a better appeal. I don’t like the design of the Star Wheel and I believe that should have been designed with star shapes instead of red dots and should look more like the 70s Match Game Star Wheel. Also, the top dollar value for the Super Match round should be $2,500 to make the grand prize an even $5,000 simply because it sounds more appealing than a $4,000 top prize on any given game show. Overall, as I have stated earlier, this is the best revival of Match Game I have seen since the 70s version. The celebrity panelists selected for this series are as entertaining and have the same enthusiasm as the panelists had back during the Rayburn era. It gives the viewers who have watched the show faithfully when they were younger a feeling of nostalgia and gives them a chance to be a part of the show’s great legacy, whether they are a contestant, studio audience member, or a panelist. This Match Game revival made proper changes where needed and maintained the same excellent show pace as on the 70s version by focusing the game while having fun at the same time. It’s a longshot, but I can see this show lasting for more than three seasons. I’m not sure how the show is faring ratings wise on The Comedy Network, but judging from the episodes I have seen, the cable network might want to hang on to Match Game. Watch new episodes of Match Game weeknights at 8:00pm on The Comedy Network! Meanwhile, get ready to match the stars and check out a few episodes from the new Match Game series by clicking on one of the links below! Enjoy!